Alien Gear makes a great IWB concealed carry holster for the money. 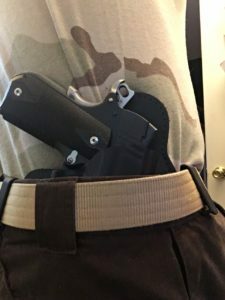 If you are looking for a comfortable way to carry your handgun concealed, an inside the waistband kydex concealment holster may be what you are looking for. Whether you have a Glock 19 or a 1911, there is a concealed carry holster from Alien Gear Holsters that will allow you to comfortably wear your weapon all day long. Finally, a holster without the poking and painful digging that occurs with other styles of holsters, while maintaining the security and safety of your firearm. The comfort comes from a large padded section between your body and firearm. The security of the firearm is accomplished by the use of a custom fitted kydex (or polymer) shell. 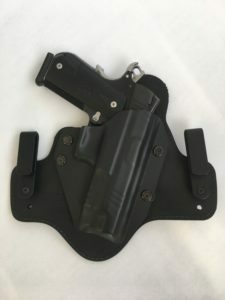 This is the a great tactical holster choice for people who want to carry their pistol on the hip in the 4 to 5 o'clock position, or even "small of the back" position. -Each holster is made specific to your weapon. This provides a custom fit, covering the trigger guard for safety and creating excellent retention. -Works great with tucked or un-tucked shirts. Convenient and comfortable, you can wear your weapon with the concealed carry clothes you choose. -They have a kydex holster for most guns. Glock, Sig Sauer, Ruger, Beretta, Keltec, Kimber and over 30 other brands, and hundreds of models. Just specify the concealed carry holster for your gun! -You can trade in your shell for a different gun for free, or you can purchase additional shells for your holster. -Easily adjustable tilt and ride height. Make it fit just right for you. -Easily adjustable retention. Innovative green washers allow precise adjustment to your requirements. -High quality components. The backing is multi-layered with leather and a thin sheet of metal in between for stiffness. This creates the perfect balance between comfort and performance. - Tough, durable shell that will never lose its shape. The shell is not actually kydex, but made of a super durable polymer that is much thicker and stiffer than competing hybrid holsters that use a thin piece of kydex that can lose its shape over time. 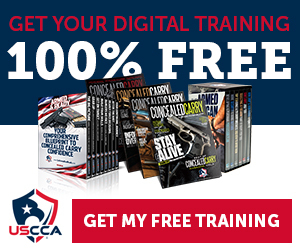 -Easy on your concealed carry clothing. The thick, rounded edges prevent snags and reduce friction wear. For the most part, I really like the holster. There are a couple things I didn't like, but I will get to that. I bought the 1911 version for my Sig Sauer Nightmare. It arrived in a matter of days packaged handsomely in a reusable Alien Gear bag. As expected, it fits the gun flawlessly. Fits my Sig Sauer 1911 like a glove! The holster looks really nice, too. But in the end, it is functionality that matters here. It comes with plenty of extra hardware for adjustment or replacement as needed. I was immediately impressed with the out-of-the-box comfort of the 3.0. They advertise that the holster conforms immediately to your body with no break in period needed, and I can confirm this fact. The holster was comfortable right out of the box and fits my 1.5" Wilderness Instructor belt securely. The belt clips are mounted with spacers to allow the option of tucking in your shirt around the gun. 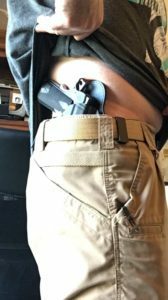 This method of concealed carry works best with thinner firearms, but you can get away with with a full size gun if the shirt is looser fitting. . I carry a 1911 Sig Sauer Nightmare (Commander barrel length) and generally go with an un-tucked T-shirt or 5.11 Tactical shirt that is a button down and looks great un-tucked, but I like to have the option. I wore this holster for 30 days so far and it is indeed comfortable. I have to say, it was quite comfortable from Day 1. The soft padding against my skin is all I feel, no edges of the gun digging into my back when I drive or sit at the kitchen table. I did not experience any movement of the holster or concern that the gun was not secure as I went about my day. When you don't think about your gun, it means you have a comfortable holster! Don't get me wrong, when you carry a 1911 or other full size gun, you know it is there! But it is nice when it is comfortable vs. a lower quality holster that will actually allow the firearm to cause pain in many situations. I am now wearing my Alien Gear holster fairly often (depending on the gun I choose to carry), and I have recommended this holster to friends as well. Ok, nothing terrible here, just a few details that I need to point out. -It's tricky to get on if you are already dressed. Since I don't always carry in the house, I put the holster on when I go out and take it off when I come home, so I like it to be easy to manage. -The clips are plastic. The plastic clips are GREAT at staying securely attached to my belt, but this also makes it tricky to put it on halfway around my back. (Gotta say, my Crossbreed Supertuck is MUCH easier on and off). Also, in my opinion, the clips look a bit cheesy and dont really "flow" with the look of the belt. Steel clips just look better. -The adjustment screws are a bit troublesome. Although the ability to adjust the height, cant, and retention is a huge plus, once you adjust it to your liking, you better drop some Loctite on the threads to keep them from loosening. Look, Crossbreed makes awesome holsters, (I own two and still use my 1911 Crossbreed Supertuck going on 8 years) and heck, they really invented this type of holster. Alien Gear came along and made it cheaper. And a little prettier. If you aren't on a tight budget, by all means, buy a Crossbreed Supertuck, you will not regret it. If you need to spend a bit less, Alien Gear is your holster. I feel I need to say here that I still use my Crossbreed most of the time. I have worn it for many, many hours each week for 6-7 years now. It looks like hell but it is so easy to put on, and mine has not loosened up, NEVER needed adjustment, and it secures my Kimber Pro Carry as good as it did when I bought it. I think I will write a review for that holster as well! -Price. Alien Gear, $52. Crossbreed Supertuck, $90. -Adjustable retention. Tension can be adjusted with the included Allen key at any time, the Crossbreed will loosen up over time and need to be tightened. There is a method using a hair dryer to heat up the kydex, or you can send it to them to do it at only the cost of shipping. -The entire barrel is covered and protected. The Crossbreed and other brands leave the barrel and front sight exposed, which can snag and damage your clothing. ==>Get an Alien Gear Cloak Tuck 3.0 Today! "...This is by far the most comfortable iwb holster I've ever worn. Day 1 and it felt like it was already broke in. I carry a full sized S&W M&P 9mm and this holster has no problem with it. I look forward to seeing what they come up with next." -onelesshero Amazon customer. "...Best concealed IWB holster I've have ever worn, and I have a lot of them. I hate that it took so long for me to listen to my friends and just buy one. Save time and money, buy this holster!" Thanks for checking out my review of the Alien Gear Cloak Tuck IWB Holster. Also see my review on the DeSantis Die Hard Ankle Holster. Hi! Great post!! Very useful and full of details! I like the way you advice on how to manage all the aspect of Cloak Tuck 3.0. I’m not an expert in the field but I truly believe that people should consider the possibility to buy a weapon for self defense. With this tool you can bring it with you and feel comfortable. Thanks for the comment, Nik! In todays world with all the crime and mass shootings, I feel it is a great idea to have the tools and training to defend yourself and your family at all times. This holster is an affordable and comfortable way to carry your handgun wherever it is legal to do so. I really like the Alien Gear Holster. I liked it so much that I bought 2 of them. 1 for my wife and 1 for me. 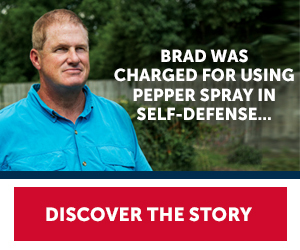 I was browsing for a holster and came across your website. Thank you for a great review. I’ve been looking for the right holster for a while now and I’m sure I found it. Jack, thanks for the comment! You will like these holsters! They are comfortable and they will last a long time for you! what an elaborate review! Im interested one day purchasing a clock tuck 3.0. I know in your post you mention that the comfort is seamless. However, in your photo of you demonstrating it, it looks like it comes up quite high on to your hip. Does the top of it ever accidentally fold into your hip and does it restrict your movement of twisting your body left to right? Thanks for the comment, Larissa! The holster is adjustable, so you can have it sit lower than I have it in the pictures. No, the holster never folds over, nor does it move at all during the day. My movements are not restricted much either. If you are carrying a larger gun in the holster, there are a few movements that are a bit uncomfortable, but once you get used to wearing the gun and holster, you really don’t notice it much at all. Ah yes this is awesome! 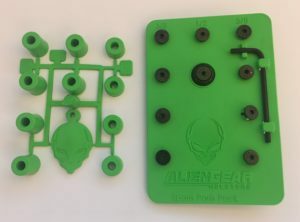 I’m getting into guns recently and my friend who is in the military is a nut for guns and he has 3 or 4 different holsters that I’ve seen – so I’m definitely gona direct him to this post as this Alien Gear holster sounds really cool. I got a really nice Smith & Wesson handgun recently, and I’m thinking I might get this holster myself – but you don’t mention Smith & Wesson being compatible with this holster, can I use it? Thanks for the comment! Alien Gear makes a holster for most gun models. I am certain that you will find that they have one that fits your Smith & Wesson. Very nice conceal carry holster. I have been looking for a nice conceal carry holster. I carry S&W MP 40 full size. Currently I carry a Black Hawk Serpa holster. Is there a Kydex holster that will fit my firearm? I have tried a few Glock holsters and some work and some don’t. What do you think? Any advise? Ed, thanks for the comment. Yes! There is a holster for your exact handgun. Alien Gear, Blade-Tech and many other companies make excellent holsters to the exact specifications of your weapon. I was in the military for 9 years and had to carry a weapon, but we didn’t have holsters like that! I remember going thru the airport with my weapons, and mine were not concealed in any way. As a woman off-duty, I still like to protect myself, and concealing the weapon where others can’t tell it’s there would be nice. I’d much prefer a holster like this rather than putting the weapon in my purse because sometimes I can be forgetful and put it down. My only concern is that it looks a little bulky for wearing a skirt or something. Have you seen any holster options suitable for women who wear skirts or dresses? Thanks for the comment! Yes, carrying your gun on your person is a much better option that having it in a purse. There are new carry options for women coming out all the time. Check out thewellarmedwoman.com for some interesting products that may help.